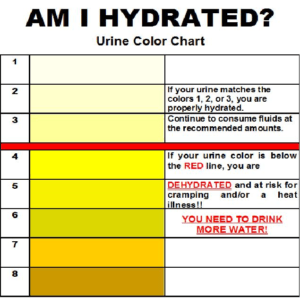 Hydration, Why is it so important? Fluid balance is very important for all athletes. Most often athletes do not realize how much fluid they lose during exercise until they perform the sweat test. On average sweat rates range from 1 to 4 pounds per hour. However, this depends on gender, exercise intensity, clothing, body size, sport, ambient temperature, how well you are trained, and lastly whether or not you are heat acclimatized. As an athlete or a frequent exerciser it is essential that you begin your workout with your body in water balance to support maximal performance. If you begin your training session in negative water balance you will likely experience an early onset of fatigue, lack of concentration, and experience a lack of motivation or inability to perform at your best. After a hard workout, it may take 8 to 12 hours to rehydrate. The pre-hydration goal is to drink approximately 5 to 7 ml per kg of body weight at least 4 hours prior to exercise. For 145 pound athlete (65.9 kg), this equates to 330ml to 460 ml, roughly 11-15 ounces. It is important to hydrate several hours before exercise and not right before as this doesn’t allow enough time to eliminate the excess fluid before starting the workout. Too much fluid results in excessive urination during a race or workout. Over-hydration can also contribute to low blood sodium and if you continue to aggressively hydrate during exercise, you may be increasing your risk of developing hyponatremia (low blood sodium which can be problematic or fatal in some instances). Pre-workout coffee/caffeine not only boosts performance, but can also act as pre-exercise hydration. Rest assured, caffeine, in moderate doses~ 12 ounces of coffee or 200 mg caffeine is unlikely to increase your daily urine output or cause dehydration. So go ahead and enjoy that cup of Joe if desired! It is important to note that not everyone achieves a performance benefit from caffeine, but some do. There is a saliva test now available that can help you determine if you will benefit from pre-workout/race caffeine. Before starting a workout or race be sure that you are well hydrated to ensure you are optimizing your performance. Remember, fluid is a basic building block of life, do not neglect it, your body needs it, and you cannot function without it. We will follow up shortly on hydration during and after training sessions to guarantee you are achieving your top results. Jenny Ives is a registered dietician (RD). Jenny recently earned her master’s degree in exercise science and sports nutrition. She was a national level elite cyclist for 10 years racing both road and cyclocross. Prior to that, she was a collegiate soccer player and runner. She now enjoys hiking, paddle boarding, and running to stay healthy with her family in the Albany area. She work for a home infusion company managing nutrition prescriptions for those who cannot eat, and for Kinetic Sports Medicine as a consultant for athletes of all levels that need nutrition intervention. Jenny also work with several triathlon teams, and looks forward to sharing her knowledge and experience with the Chargers.